During the summer months we all love to make plans of picnics and days out in the park and this very handy and practical promotional item from Calendar Lady Promotions is the ideal beach picnic accompaniment. Our Straw Beach Mat With Logo comes with your business details and company logo printed upon, so when your down on the beach your business details and company logo will be displayed loud and proud. 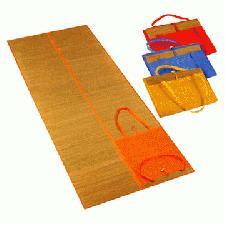 The Straw Beach Mat With Logo is a straw beach mat with cotton carrying handle and pocket. So advertise your business details upon our Straw Beach Mat With Logo today! Available in Red, orange, Blue and yellow. To find out more about our Straw Beach Mat With Logo click here and fill in the contact form and we'll get straight back to you. Other promotional and personalised items besides our Straw Beach Mat With Logo click here.